After thirteen years of the failed war on terror, it’s time to scrutinize America’s assumptions about military involvement in the Middle East. Few in Washington would endorse M’s assertion, of course. 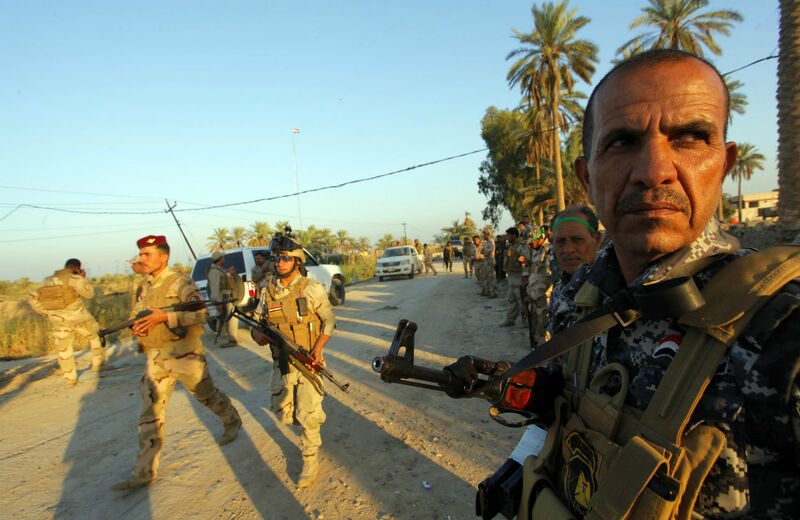 Inside the Beltway, policymakers, politicians and pundits take Iraq’s existence for granted. Many can even locate it on a map. They also take for granted the proposition that it is incumbent upon the United States to preserve that existence. To paraphrase Chris Hedges, for a certain group of Americans, Iraq is the cause that gives life meaning. For the military-industrial complex, it’s the gift that keeps on giving. Arguably, each of these propositions once contained a modicum of truth. But when the United States invaded Iraq in 2003 and, as then–Secretary of State Colin Powell predicted, broke the place, any merit they previously possessed quickly dissipated. Years of effort by American occupiers intent on creating a new Iraq out of the ruins of the old produced little of value and next to nothing that has lasted. Yet even today, in Washington the conviction persists that trying harder might somehow turn things around. Certainly, that conviction informs the renewed US military intervention prompted by the rise of IS. So when David Ignatius, a well-informed and normally sober columnist for the Washington Post, reflects on what the United States must do to get Iraq War 3.0 right, he offers this “mental checklist”: in Baghdad, the United States should foster a “cleaner, less sectarian government”; to ensure security, we will have to “rebuild the military”; and to end internal factionalism, we’re going to have to find ways to “win Kurdish support” and “rebuild trust with Sunnis.” Ignatius does not pretend that any of this will be easy. He merely argues that it must be—and by implication can be—done. Unlike my friend M, Ignatius clings to the fantasy that “Iraq” is or ought to be politically viable, militarily capable and socially cohesive. But surely this qualifies as wishful thinking. The value of M’s insight—of, that is, otherwise intelligent people purporting to believe in things that don’t exist—can be applied well beyond American assumptions about Iraq. A similar inclination to fantasize permeates, and thereby warps, US policies throughout much of the Greater Middle East. Consider the following claims, each of which in Washington circles has attained quasi-canonical status. * The presence of US forces in the Islamic world contributes to regional stability and enhances American influence. * The Persian Gulf constitutes a vital US national security interest. For decades now, the first four of these assertions have formed the foundation of US policy in the Middle East. The events of 9/11 added the fifth, without in any way prompting a reconsideration of the first four. On each of these matters, no senior US official (or anyone aspiring to a position of influence) will dare say otherwise, at least not on the record. Yet subjected to even casual scrutiny, none of the five will stand up. To take them at face value is the equivalent of believing in Santa Claus or the Tooth Fairy—or that John Boehner and Mitch McConnell really, really hope that the Obama administration and the upcoming Republican-controlled Congress can find grounds to cooperate. The Presence of US Forces: Ever since the US intervention in Lebanon that culminated in the Beirut bombing of October 1983, introducing American troops into predominantly Muslim countries has seldom contributed to stability. On more than a few occasions, doing so has produced just the opposite effect. Iraq and Afghanistan provide mournful examples. The new book Why We Lost, by retired Lieutenant General Daniel Bolger, finally makes it permissible in official circles to declare those wars the failures that they have been. Even granting, for the sake of argument, that US nation-building efforts were as pure and honorable as successive presidents portrayed them, the results have been more corrosive than constructive. The IS militants plaguing Iraq find their counterpart in the soaring production of opium that plagues Afghanistan. This qualifies as stability? And these are hardly the only examples. Stationing US troops in Saudi Arabia after Operation Desert Storm was supposed to have a reassuring effect. Instead, it produced the debacle of the devastating Khobar Towers bombing. Sending GIs into Somalia back in 1992 was supposed to demonstrate American humanitarian concern for poor, starving Muslims. Instead, it culminated in the embarrassing Mogadishu firefight, which gained the sobriquet Black Hawk Down, and doomed that mission. Even so, the pretense that positioning American soldiers in some Middle East hotspot will bring calm to troubled waters survives. It’s far more accurate to say that doing so provides our adversaries with what soldiers call a target-rich environment—with Americans as the targets. The Importance of the Persian Gulf: Although US interests in the Gulf may once have qualified as vital, the changing global energy picture has rendered that view obsolete. What’s probably bad news for the environment is good news in terms of creating strategic options for the United States. New technologies have once again made the United States the world’s largest producer of oil. The United States is also the world’s largest producer of natural gas. It turns out that the lunatics chanting “drill, baby, drill” were right after all. Or perhaps it’s “frack, baby, frack.” Regardless, the assumed energy dependence and “vital interests” that inspired Jimmy Carter to declare back in 1980 that the Gulf is worth fighting for no longer pertain. Access to Gulf oil remains critically important to some countries, but surely not to the United States. When it comes to propping up the wasteful and profligate American way of life, Texas and North Dakota outrank Saudi Arabia and Kuwait in terms of importance. Rather than worrying about Iraqi oil production, Washington would be better served ensuring the safety and well-being of Canada, with its bountiful supplies of shale oil. And if militarists ever find the itch to increase US oil reserves becoming irresistible, they would be better advised to invade Venezuela than to pick a fight with Iran. Arab Allies: It’s time to reclassify the US relationship with both Egypt and Saudi Arabia. Categorizing these two important Arab states as “allies” is surely misleading. Neither one shares the values to which Washington professes to attach such great importance. For decades, Saudi Arabia, Planet Earth’s closest equivalent to an absolute monarchy, has promoted anti-Western radical jihadism—and not without effect. The relevant numbers here are two that most New Yorkers will remember: fifteen out of nineteen. If a conspiracy consisting almost entirely of Russians had succeeded in killing several thousand Americans, would US authorities give the Kremlin a pass? Would US-Russian relations remain unaffected? The questions answer themselves. Meanwhile, after a brief dalliance with democracy, Egypt has once again become what it was before: a corrupt, oppressive military dictatorship unworthy of the billions of dollars of military assistance that Washingtonprovides from one year to the next. For the government of Israel, viewing security concerns as paramount, an acceptable Palestinian state will be the equivalent of an Arab Bantustan, basically defenseless, enjoying limited sovereignty and possessing limited minimum economical potential. Continuing Israeli encroachments on the occupied territories, undertaken in the teeth of American objections, make this self-evident. It is, of course, entirely the prerogative—and indeed the obligation—of the Israeli government to advance the well being of its citizens. US officials have a similar obligation: they are called upon to act on behalf of Americans. And that means refusing to serve as Israel’s enablers when that country takes actions that are contrary to US interests. Eliminating terrorism is a chimera. It’s not going to happen. US civilian and military leaders should summon the honesty to acknowledge this.